If this has a decent campaign, I could be into this. Mostly because of the characters, I'll be honest. They look sufficiently ridiculous. Our version of Overwatch? Anyway, the actual gameplay looks cumbersome, but I'm still tempted to give it a look. More like our World of Tanks, but as that's the driest game ever made and this looks really fun, I'm pretty into it. It's a shame it's local multiplayer only (unless I'm remembering incorrectly) as a title like this would shine with a bit of online multiplayer. As Balla says, if the single player content is looking good then it might be seeing a look - without a solid campaign though, and without anyone to play it with locally, then there'd be little point to me picking it up. It does look interesting though - the cast of characters should liven it up nicely, I reckon. When I saw it, all I could think of was Tank! Tank! Tank! which lacked online and really should have. I had to check,but according to Polygon,you are! It would have been mad not to have online play on this. Ah, good! I think I was getting this and Mario Party confused, as there was chat about that being local multiplayer only again. One to keep my eye on but there wasn't enough to the trailer to whet my appetite. That said, THE SQUAD, as Balla mentioned. If they made an anime series centred around the squad, I'd watch it. I'd watch all of it. This looks OK but it only makes me want an Advance wars/battalion wars sequel. Released on Thursday. Anyone still up for this, or is that £7.19 going in the Switch fund? I'm going to tank it up because I reckon I need something to play alongside DQVII. Not that money is going to Switch fund but I feel now with the 3DS, I'll only be picking up the likes of Echoes and not a lot else. I'll be honest - I'd totally forgotten about this! I've no plans to break my "no buying new games before Switch rule", so this won't be tempting me yet. After initially being tempted, a second look has shown that it's a bit slow (as well as requiring aiming abilities). I'll be looking at reviews, but without much excitement. I could probably do with a break from gaming once Picross 3D 2 is done and dusted. Part of me is tempted by the idea of picking this up if Zero and others do, but I'm hesitant with the Switch approaching fast. I've a feeling it's pretty much going to be just me with the game around these parts, Drunkalitleo. I'll send y'all my thoughts on it once I've racked up a decent playtime on it. I might go for this. Thoses trailers aren't telling me much about it though. I'll see what the reviews are saying. 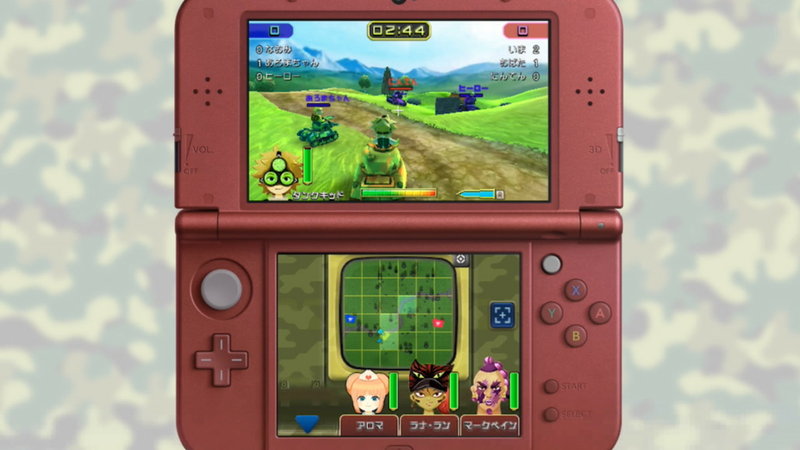 I'd be more up for something that's less like Advance Wars and more like Batallion Wars. Got it, blundered through the tutorial and the first mission. It seems alright - faster than I was expecting, though turning is an issue (tanks cannot turn quickly! Who knew?!). The character stuff that made the game famous has yet to really drop, though - they just appear as time-limited special moves. More on this when I have it. How was this in the end? I listened to the episode of War College about tanks at work today and I really feel like driving a big ol' tank. I've got Bugs Vs Tanks on 3DS, and I've always dreamed of completing all 100 levels of the Wii Play Tank Game, but I don't know if either of them will scratch the itch. Too top-down and abstract. Hopefully this feeling will pass. I haven't road tested the multiplayer but the single player is fun enough. Having said that, I can't crack Mission 14. Even the fandom thinks it stinks.